Phew. Okay kids, I promised you sugar and here it is. All of it. So much. 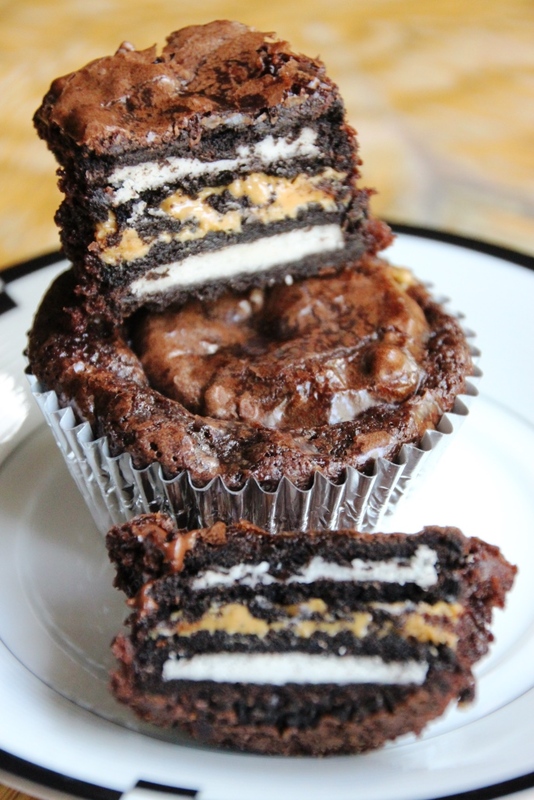 The other week Pinterest lit up with these brownie Oreo peanut butter cupcake delights. The ones I happened across didn’t lead to a recipe, but it looked pretty straightforward. All I needed was a reason to make them because I certainly wasn’t going to eat 18 of these babies. Luckily, my work had a charity bake sale and these immediately came to mind as something I could donate. 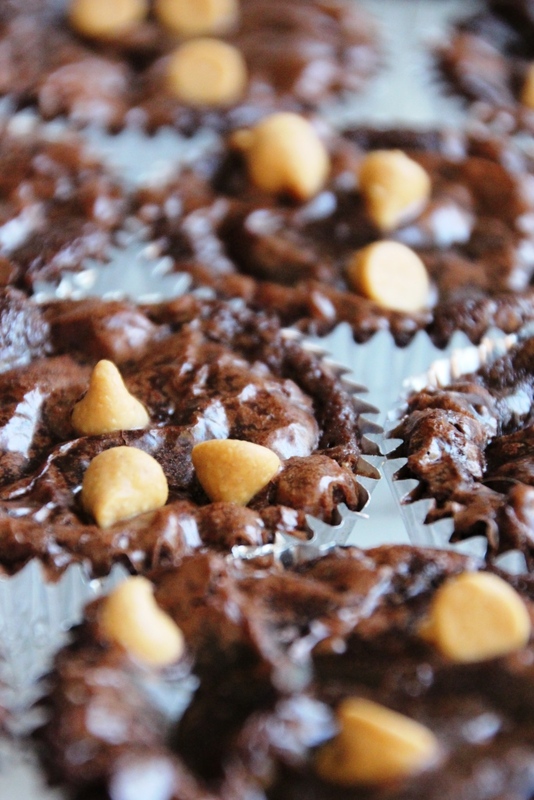 Due to the brownie mix (which is one of the few things I’m okay using a mix for), these come together simply with relatively little time commitment and are easy to transport for parties. But let me warn you, they are rich! I am not normally one of those people who thinks thing are too sweet (I can eat chocolate pudding pie for daaaays) but these take it to a whole new level. I also don’t typically eat packaged candy (which is probably part of why it’s a bit overwhelming to me) but I made an exception for these. With a glob of peanut butter sandwiched between two Oreos and surrounded by brownie, these things do not mess around. Maybe you only want half of one, maybe you want five, I don’t judge. The fudgy-ness of a brownie, the crunchy-ness of an Oreo, and a smooth peanut butter filling give you all the textures you could want in one chocolatey bite. I topped mine with some Reese’s peanut butter chips for some added flair, and because I always have them on hand anyway. Totally not necessary but they do look prettier that way, and as we all know: you do eat prettiness. Preheat oven to 325 degrees Fahrenheit. Line muffin pans with cupcake liners and lightly grease with cooking spray. Mix the brownie batter according to package directions and set aside. Gently press a second cookie on top of the peanut butter, pressing down till the peanut butter is spread evenly across the cookie. 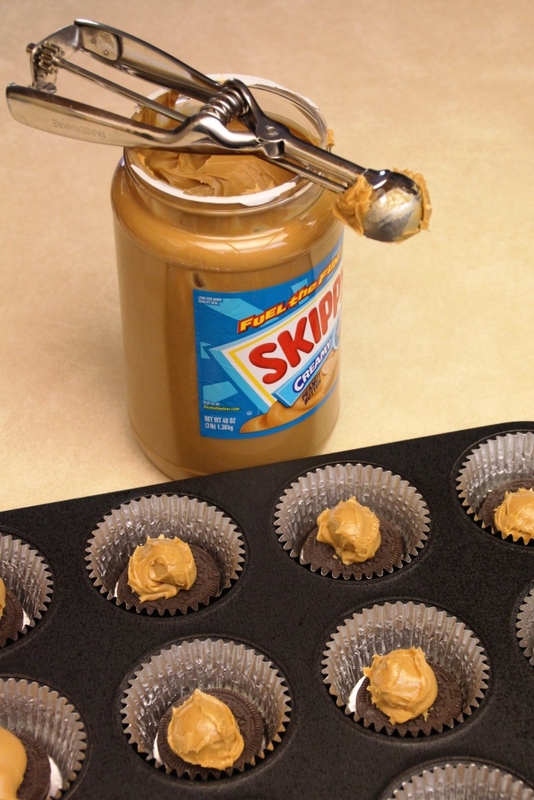 Top with Reese’s peanut butter chips (optional). Bake 20-25 minutes (the tops should be matte). Let cool completely in the pan, then store in an airtight container. 1 I used the Ghirardelli brownie mix that Costco sells, but it would be much easier to use a mix that doesn’t have chocolate chips/chunks in the batter. 2 You may have a little leftover brownie batter, just bake it in additional liners, filling each about 2/3 full. Great for brownie sundaes after you’ve given all these away.